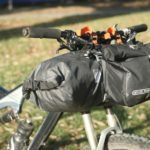 I was pretty excited when Ortlieb announced they were dropping a line of bikepacking bags (including this Ortlieb Handlebar Pack). After all, this is a brand that has been innovating waterproof panniers since the 1980s. 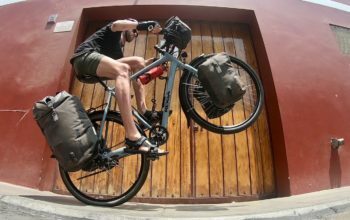 The Ortlieb bikepacking set includes a 16-litre seat pack, a 6-litre frame pack, a 3.5-litre accessory pack and the handlebar pack on review here. All models are made using a PU-coated nylon fabric that is lightweight, waterproof, PVC-free (no petroleum used) and rather abrasion resistant. 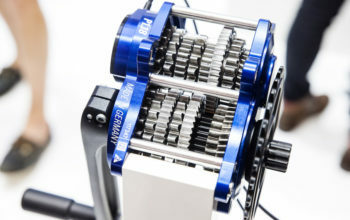 It seems that Ortlieb have cut no corners with regards to materials, parts and fittings – they’re all A1 quality across the board. I’ve been thrashing the Ortlieb Handlebar Pack about for five months now, including two solid weeks on the Munda Biddi Trail. I’m now confident that these bags are the real deal. Head HERE to read my review of the Ortlieb Seat Pack. Let’s start with the attachment system for this handlebar drybag. Ortlieb use a two-step mounting process which makes it easier to get your pre-packed bag on the bars. 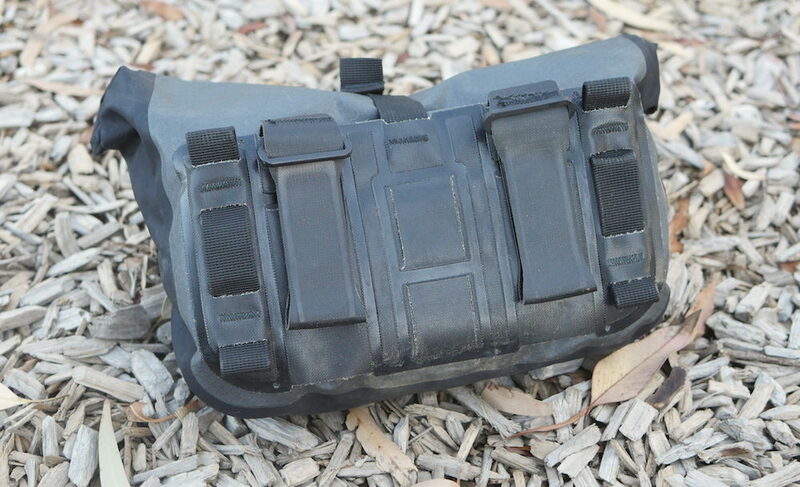 Rather than trying to support the bag weight AND find the buckles with your other hand, a velcro strap system is used as the first step in connecting your bag to the bar. It’s not essential that these velcro straps are taut, you’ll just need them to grab either side of the stem so that you can have two hands free for the second step. The second step is the connecting of the orange straps and buckles. 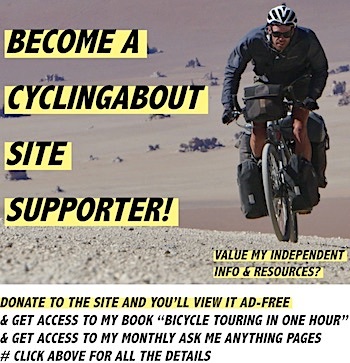 This is really easy to do given you’re no longer supporting the drybag’s weight. The fasteners are located in front of the handlebar, so just pull the orange straps back towards you until you achieve your desired tension. 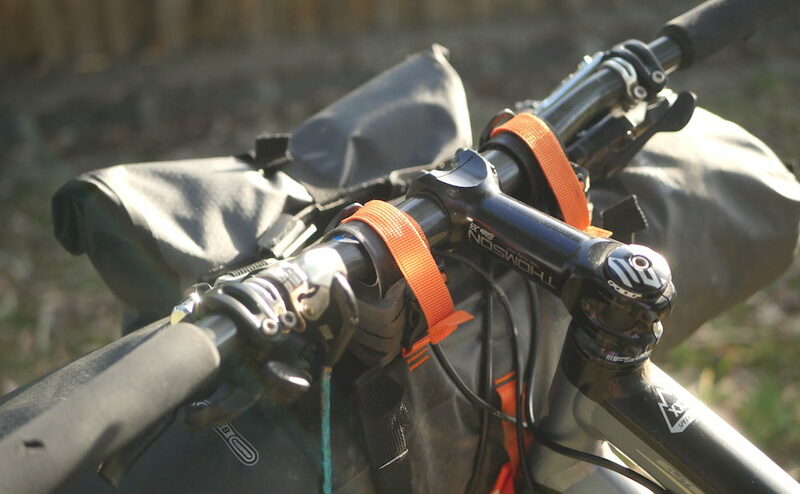 Like most bikepacking bags, the Handlebar Pack does interfere with your cabling. The worst-case scenario is that you may need to increase the length of your cables, or change the routeing in order to keep them as friction-free as possible. I didn’t find either of those necessary with my bikes. You’ll definitely want to use a heavy-duty tape at the rub points to prevent the bag from scratching at your paintwork. Included are four foam spacers which sit between the handlebar pack and your handlebar. 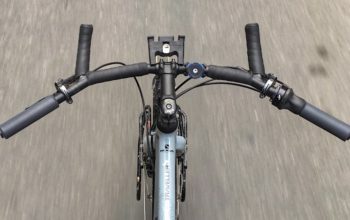 These foam spacers are excellent for two reasons: they provide a physical distance between the tops of a road handlebar and your hands, and on a flat handlebar they create enough space to clear your brake levers. I’m rather surprised that many other mainstream bikepacking bags do not include spacers like this. A side benefit that I’ve found is that my brake and gear cables can filter through the foam spacers. This seems to prevent cable kinks and keeps my shifting nice and crisp. The third stabilisation point is at the headtube. 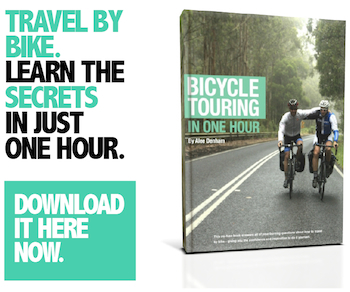 There are three possible loops on the back of the bag which you can select, depending on your bike setup and size. To increase the gap between the handlebar bag and your front tyre, I’ve found that you can velcro up to the middle of the head tube or even around the stem to give it a few centimetres ‘lift’. The only downside seems to be that the bag will wiggle around a little more due to having less overall support. 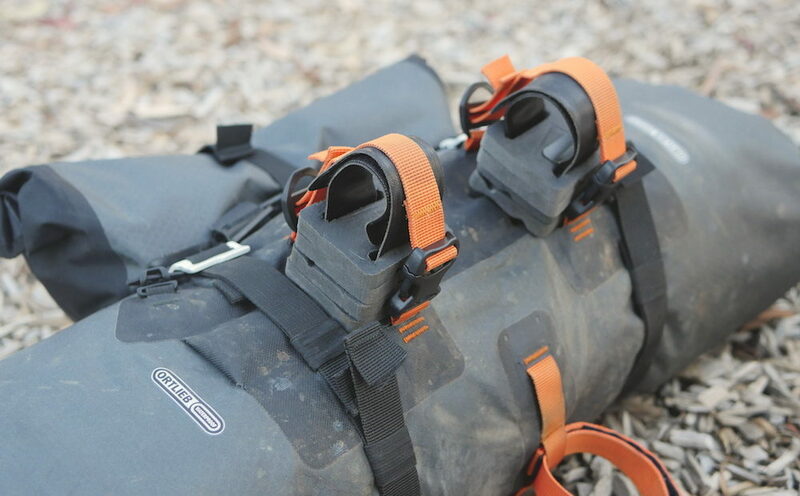 The Ortlieb Handlebar Pack employs a roll closures on either side. This means you can essentially select how large you want the bag to be based on what you’re carrying. Roll the ends as many times as you need, give them a clip and you’re done. I found myself only opening one side for the most part as I always pack and repack my gear in the same order. 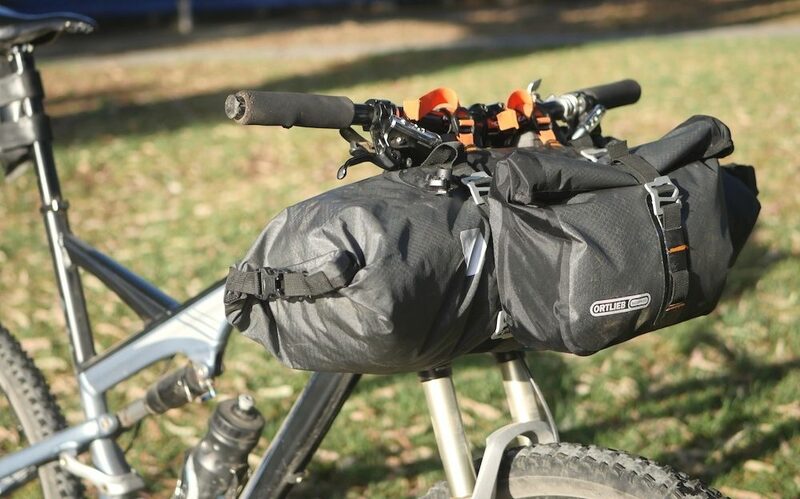 One thing to consider with this bag is whether it will fit your bike. With a short headtube and a close distance between your handlebar and front wheel, the Ortlieb bag may have a diameter too large for your bike. Unfortunately, the bag is only available in one diameter – 20cm – which is the equivalent of the largest Revelate handlebar roll. In comparison, the smallest Revelate bag provides an additional 3cm clearance from the wheel (6cm smaller in overall diameter). I found the Ortlieb Accessory Pack (3.5L / 207g / US $75) to be a brilliant addition to the Ortlieb Handlebar Pack. When this bag came out last year, my initial thoughts were that it was unnecessary given the quick access stem and frame bags on offer. But despite preferring stem bags for feeding while riding, I enjoyed having bulky foods like apples, bananas, bread and soft drink cans in the Ortlieb Accessory Bag. It was generally big enough to store a days worth of food, plus my rain jacket. I’d say I accessed this bag more than any other for most of my bikepacking trips – it’s super handy. 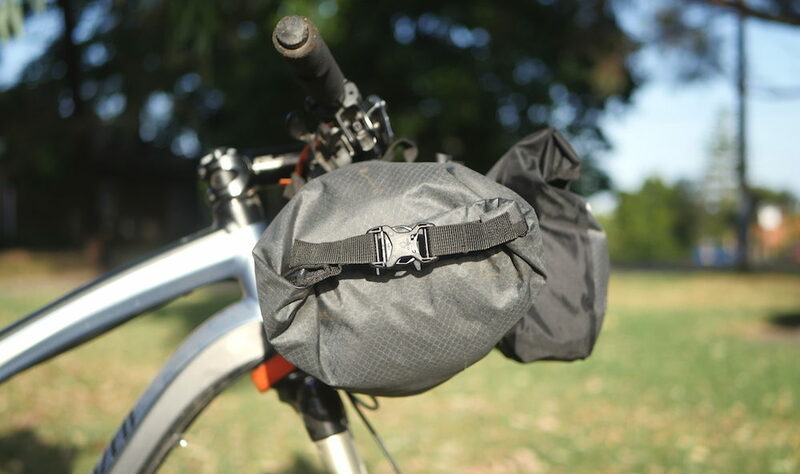 The Ortlieb Accessory Pack clips onto its bigger sibling using the four purpose-made hooks of the Handlebar Pack. 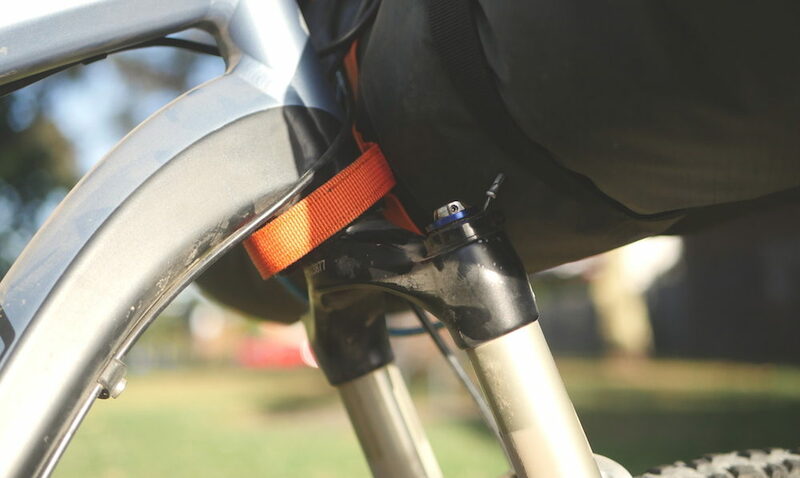 These hooks each have a tension point which allows you to adjust the height of the bag on the front of your bike, and thus prevent it from drooping into your front wheel. 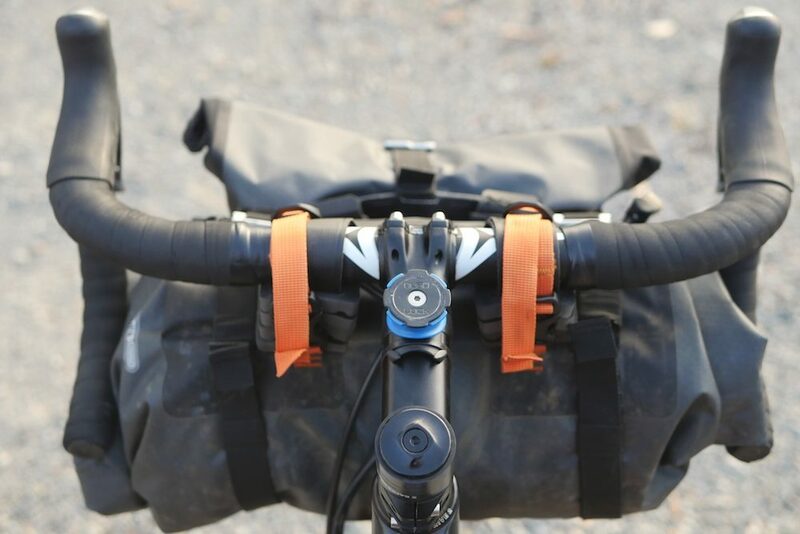 There are velcro straps built into the Accessory Pack so that you can mount it directly to your handlebar too. While I appreciate the additional versatility of this design detail, I feel like these straps could’ve easily been removable. It’s not a big deal, but they are probably surplus to most people’s needs. 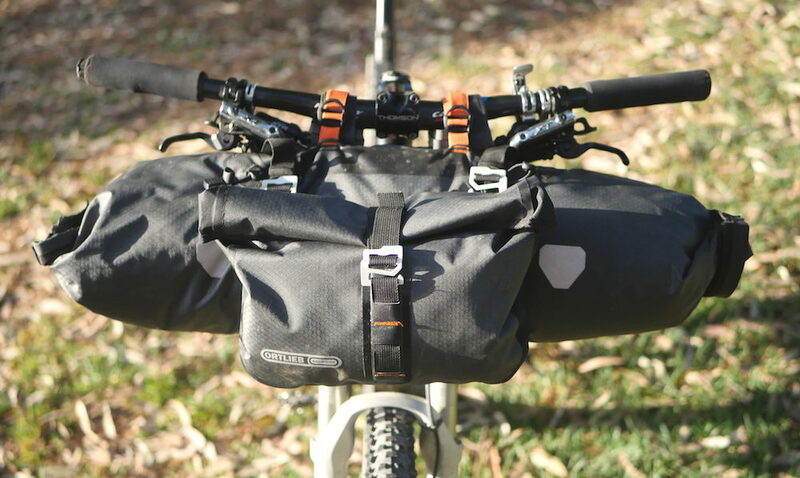 The Ortlieb Handlebar Pack will fit nicely to a road handlebar. The major downside to drop bars is that you’ll lose about half the bags capacity, bringing the Ortlieb bag to about 7-8L. This is another argument for using the Accessory Pack, as it boosts your storage back up another 3.5L in a conflict-free location. Again, I must mention that the foam spacers are a godsend for road handlebars as they create room for your hands on the tops. I don’t know why all handlebar packs don’t afford this detail. Ortlieb have nailed it the first time with the Handlebar Pack and Accessory Pack – they’re good. Properly good. A standard to beat! I’ve been really happy with the materials, design and quality of these bags. They’re stable, waterproof and easy to fit. There are a few things that could be improved, however. I’d like to see a smaller size option (14-15cm diameter) so that riders with less handlebar-to-wheel clearance can still use them. 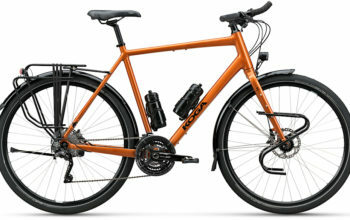 I’d love to see a few colour options as the grey and orange won’t suit every bike. Another idea that would reduce brake and shift cable interference is a handlebar cradle. This stabilisation system is weight limiting, heavier and more annoying to switch between bikes, but I think Ortlieb could work with something here. Actually, I’d be surprised if we didn’t see an Ortlieb model that used this system in the coming years. 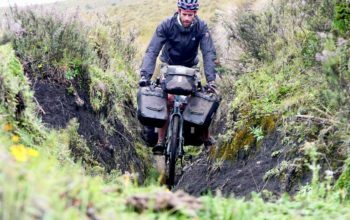 Disclosure: The Ortlieb Handlebar-Pack and Ortlieb Accessory-Pack were provided for this review. Quality of manufacturing is A1. A smaller diameter model is necessary. I'd love to see more bag colours. Will scratch your bike if you don't tape wear areas.